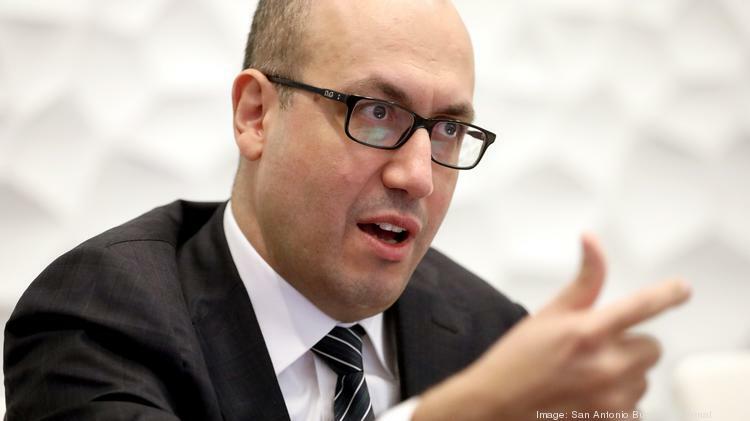 Onur Genç, CEO of BBVA Compass Bancshares Inc., has a straightforward goal for his financial institution in San Antonio: Attain more market position in the Alamo City to better reflect its size in Texas. From a market share perspective, that would mean climbing from No. 7 in terms of local deposits to No. 4 — matching its status as the fourth-largest bank in the Lone Star State. BBVA had about $1.51 billion in local deposits as of June 2017, putting it well behind CitiBank NA, which sits at No. 4 in San Antonio with nearly $4.2 billion, according to Federal Deposit Insurance Corp. data. While BBVA’s local deposits were down nearly 2 percent year over year, San Antonio is important to the bank, said Genç, who works in Houston and visited this city recently to meet with BBVA’s local staff. Onur Genç, who is CEO of BBVA Compass Bancshares Inc. and based in Houston, recently visited the bank’s San Antonio corporate office. “We have selected certain markets for us as priorities for our go-to-market, and San Antonio is one of them,” he said. 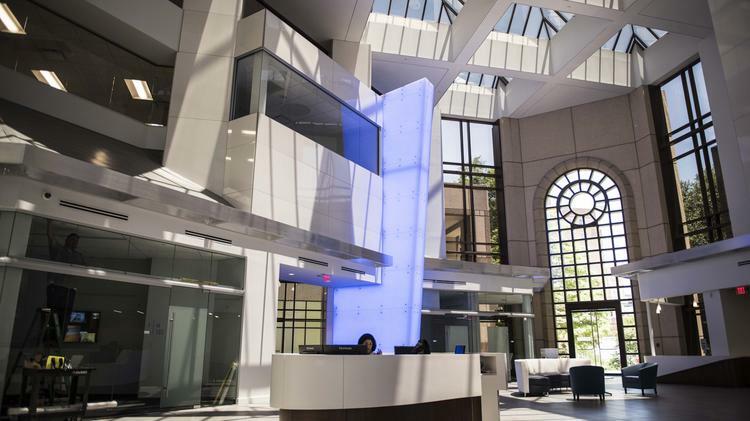 One sign of BBVA’s interest in growing in San Antonio is its investment in space in the Weston Centre downtown, a roughly $2 million renovation that included a retail branch on the ground floor and its new local corporate office on the second floor. The new space could help attract retail banking customers and boost local deposits. The bank’s staff regularly treks around downtown, just a few blocks from Houston Street, for business meetings with potential clients, executives said. Inside BBVA Compass’ new corporate headquarters downtown in the Weston Centre. Meanwhile, the bank has seen double-digit growth in its local commercial lending portfolio. Under the leadership of Ryan Parker, named San Antonio CEO in July 2017, the bank saw a 30 percent increase in business loans from 2016 to 2017. “Our goal is that we continue along that trend,” said Genç, who is originally from Turkey. BBVA Compass has 224 employees in San Antonio and about a half-dozen job postings for roles that include mortgage banking officer, financial adviser and private banker. It recently hired about a half-dozen new commercial bankers. On the road to higher market share, Genç touted what he described as a competitive advantage to regional players and national branches. To grow the commercial loan portfolio, the bank has made honing in on the small and medium business loan segments one of its strategic priorities. During fiscal 2016, BBVA Compass Bank underwrote 54 Small Business Administration loans totaling $12 million, according to the SBA for its 7(a) and 504 loan programs in San Antonio. Those figures increased in fiscal 2017, as BBVA underwrote 63 loans worth $13.5 million through the 7(a) loan program alone in San Antonio. The loans ranged from $10,000 to $1.9 million during fiscal 2017, records show. 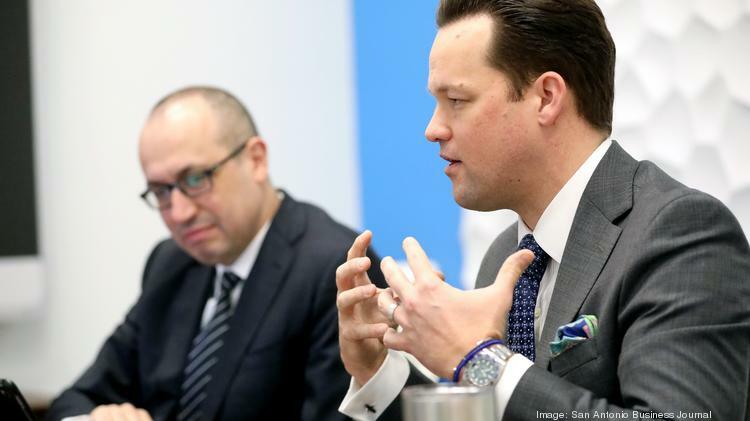 Ryan Parker, right, is San Antonio CEO for BBVA Compass Bancshares Inc.
One method to do that is investing in technology, said Genç, who was trained as an electrical engineer and was a computer coder years ago. “We do think that banking is a people business. … But millennials demand a different type of banking,” he said. BBVA has a new mobile phone-based loan approval called Express Personal Loan, which is a loan program for up to $35,000 when opened online that boasts same-day decisions.